Master lists are standard lists of items you would supply to wards, clinics, etc. on a regular basis. Once set up, a master lists can be assigned to customers or Virtual stores, and then used to support Stock Control including imprest orders. Master Lists are useful to stores which have a number of customers or virtual stores that they supply whose lists of stock items are either identical or very similar. Description field: Enter the name of the master list here - this is the list name that everyone will see e.g. Health Posts - Standard List. Note field: Add any note or information here that will help you and others understand what the list is for. Automatically add new items to this master list checkbox: If you check this, any new items created, whether manually or during import, will be added to the master list. This is a particularly helpful setting when you are using master lists to control the visibility of items in stores. The Items tab shown in the screenshot shows the list of items on the master list. The In use by tab shows which customers the master list has been assigned to (see below). On entering the first few characters of the item to be ordered and pressing the Tab key, the (by now!) familiar list will appear from which the desired item is selected by double clicking. If the imprest system is used in your organisation, the quantity is entered in the Imprest Quantity field. If the imprest system is not being used, you don't have to enter anything in this field. If you want this list to determine the price of this item for customers using it, the price is entered in the Price field. If not, no entry is required in this field. In our example, a number of master lists have been created. A sample Health Posts - Standard List master list is shown below. Sorting: Clicking on any of the column headings allows you to sort the list according to that heading; you also have the ability to click on an item in the list, and drag it to a new position; once the list is sorted to meet your requirements, you can click on the Save Sort Order icon, and mSupply® will retain the list in the order in which you have set it, and display it in that order next time it is accessed. Copy to clipboard: The master list is copied to the clipboard when this button is clicked so that you can paste it into other applications on your computer e.g. 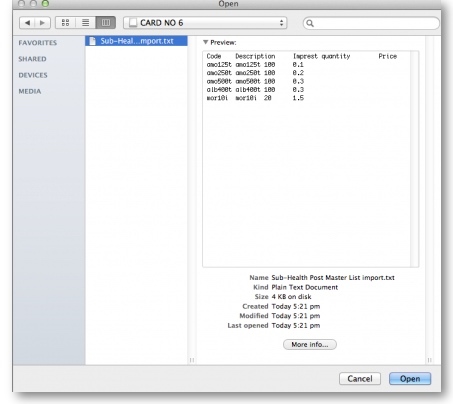 a word processor or spreadsheet application. On this screen you use the Next and Previous buttons to move through the records and see what details will be imported for each. The First line contains column headers tells mSupply whether to ignore the first record in the import file (checked = ignore first line of file). The first record in the import file often contains headers describing the fields in each record, not actual data. 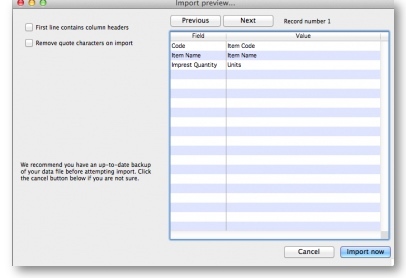 The Remove quote characters on import checkbox, if checked, tells mSupply® to strip all “ characters from the data. This is recommended. 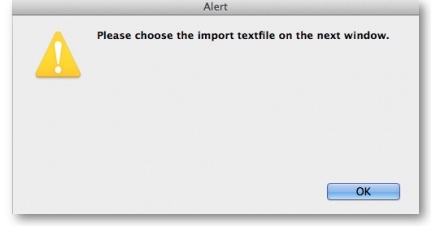 In fact, this option can be selected anyway without detriment to the import. The imported items are added to the master list, nothing is overwritten by the import. Clicking the Import now button executes the import with the settings you made and takes you back to the master list screen with the imported items now showing in your master list. The Cancel button also takes you back to the master list screen but, obviously, does not execute the import. Editing imprest quantities or price: If you click once on the row you wish to edit, and then click on the imprest quantity or price, it becomes editable. Enter the new value, and you can then use the <tab> key to advance to editing the next imprest quantity or price field. The In use by tab: Under this tab you'll find the list of customers who have been assigned to this master group (i.e. are using this master list). From the Item Master lists window, selecting the Delete Master List icon allows you to delete a list which is no longer required. This action has significant consequences for any customers who are users of the list. So to prevent accidental deletion, this action cannot be completed until any customers who are users of it have their association with it removed. Should you wish to create a Master list which is very similar to an existing one, click on this icon, and a new Master list entitled ` Duplicate of ….. .' is created; this can then be edited and renamed to suit your requirements. Once the desired customer's Edit Customer/Supplier window appears click on the Item Lists tab. Add Master list: From the list of master lists which have been created, double click on the name of the desired list. Copy from Master list: This feature would normally be used where a specific customer's drug needs differ to a minor degree from the drugs listed in one of the Master lists, or under the Imprest system where the stock levels are different from those defined on a Master list; first click on the Add Master list icon, select the appropriate Master list, add it, and it will appear under List name. With that list highlighted, click on the Copy from Master icon, and a new entry appears displaying the name of the Master list followed by `(local)'. The Master list may then be deleted, and the local copy modified and renamed as appropriate. if applied to a Master list of which the present customer is a member, it has the effect of removing that list from this customer's Favourites. The Master list remains in mSupply. If applied to a Local list, it allows deletion of the list, but only after all the items have been removed from the list by making use of the Delete Lines feature. Add item: Once you have selected a list, this allows you to add an item to that list. When operating multiple stores in mSupply, you can sometimes have difficulty with item visibility: an item might be on a master list for a particular customer but if the item is not visible in the store you are logged into when using the list, then the item will not appear. A temporary fix can be achieved by setting the item visibility in a particular store to match an item list - refer the Visibility tab. This is only a temporary fix. If you add a new item to a master list, the visibility of that item in the stores using that list will not be updated. To avoid this problem, you can set a preference (see here for details) to have the visibility of items on lists altered to match the visibility of the name for which the lists are made. Choose whether to send to Excel® or your printer. These icons appear only when a local list is selected; for obvious reasons, Master lists cannot be edited here. Add Item Self explanatory! Allows you to add required lines to the local list. Delete Item(s) Lines may be deleted, either singly or, by selecting multiple lines, they may be deleted together. Save sort order Allows you to save the list according to how you have sorted it here. Imprest: If checked, this list will populate an imprest customer stock history created for the customer. Customer stock history: If checked, this list will populate a customer stock history created for the customer. Ordering list for web: Means that the list represents all items that the customer can order using the mSupply Customer interface. If a customer who uses the customer interface for ordering stock does not have a list with this option checked, they will not be able to order any items. Price list: Means that the prices on this list will be used for these items when they are being distributed to this customer on a customer invoice. The price on this list will override any sell prices that individual stock lines have. Only one list can have this option checked for each customer. You can use master lists to control item visibility in each store, by checking the Items preference box 'Automatically update item visibility in all stores to match master lists used by each store'. This will make the items visible in each individual store match exactly the items included in the master list(s) selected for that store. This preference can drastically affect item visibility. A temporary list is created for each store containing items that cannot be removed from visibility when the master list preference is activated. Do not turn it on unless you know what you are doing! It affects ALL stores in the system. Now whenever an item is added or removed from this master list, the preference will automatically update the visibility for all of the 100 stores, so that the items visible for each individual store matches the items included in the master list. Deleting an item from a master list will automatically remove that item from visibility for each store using that master list, given it is not included in another master list in use by each store respectively. When deleting items from a master list, mSupply will first check all stores using the master list to make sure it is safe to remove that item. It is unsafe if the item has stock on hand and isn't included in another master list for any stores using master list you are editing. To create a large master list, you can export all items to be added to mSupply, and then import them to the master list - see above.